Potsdam, which lies on the river Havel, borders Berlin, is just 15 miles south west of its centre, and is the capital of the German federal state of Brandenburg. The city famously hosted the synonymous conference in July 1945 leading to the Potsdam Agreement and Declaration which brought WWII in Europe to a close. And for most that knowledge is as far as it goes, but there is plenty more to find out. The best places to stay in Potsdam are ideal for getting to know the city but they can also be used as a base if you don't fancy staying in the centre of Berlin. The city plan very much adopted the ‘spirit of enlightenment’ philosophy and ideas. It was intended to represent a picturesque pastoral dream, and around the city are a series of interconnected lakes and cultural landmarks. The Sanssouci Palace (meaning ‘without care’) was the summer home of Frederick the Great, King of Prussia. It was home to subsequent Prussian monarchs until Kaiser Wilhelm abdicated in 1918. The parks and Palace of Sanssouci is the largest world heritage site in Germany and is an absolute must for any visitor to the city. The New Garden is also worth exploring and is located just west of the Sanssouci Palace. The 100 hectares are beautifully situated between the Heilige See and the Jungfernsee lakes and contains both the Marble Palace and the Orangery. Schloss Cecilienhof is yet another palace to tempt you. This one was built between 1914 and 1917 and is modelled on the style of an English Tudor manor house. Don't forget the Filmstudio Babelsburg which is the oldest large scale film studio in the world and provides an insight into Germany's golden age of film. The Dutch Quarter is a great place to not only admire the buildings, but also for a spot of shopping. There's a wealth of independent shops, cafes and restaurants here. Our pick of the best places to stay in Potsdam vary from a charming city centre B&B to a Bavarian style luxury chalet just out of town. The 26 bedroomed luxury Hotel Bayrisches Haus is in the heart of the Potsdam game reserve and takes the form of a Bavarian chalet. In an elevated position, it enjoys panoramic views and is surrounded by nature. 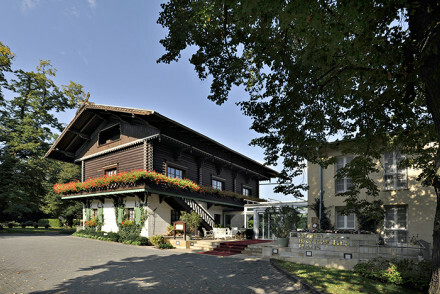 It also boasts an award winning Michelin star restaurant specializing in German cuisine. Remise Blumberg is a pretty B&B in the centre of town where you'll find spacious contemporary style rooms just strolling distance from the main attractions. 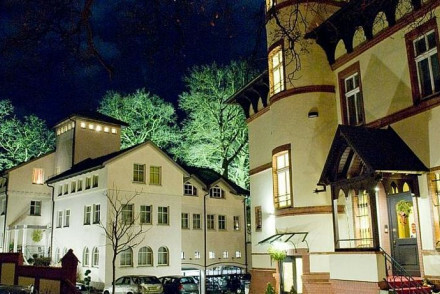 Hotel am Jagertor is an elegant hotel in the heart of Potsdam's Old Town. Think charming rooms with French windows and balconies, as well as an atmopsheric bar and an excellent restaurant. Modern luxury in the midst of Potsdam's Old Town, Hotel NH Potsdam is a superb spot. 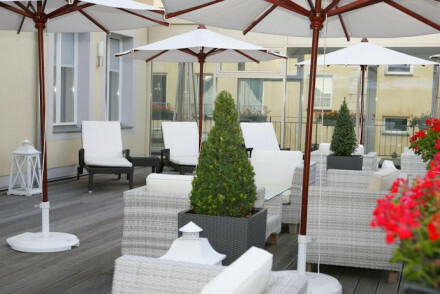 Whether you're enjoying a cocktail at the bar or relaxing on the roof terrace, it's a great place to unwind. A stone's throw from some of the city's main sights. Just around the corner from the famous sight from which it takes its name, Hotel Brandenburger Tor is immediately eye-catching. With its Baroque facade and stylishly decorated rooms, the hotel is a great base for peope to looking to explore Potsdam. Hotel Villa Monte Vino is another good pick for a central location. Plus you get panoramic city views from the top of its 17th century tower. Set in a lovely historic builidng, the recently restored Hotel Ambassador is a charming establishment. 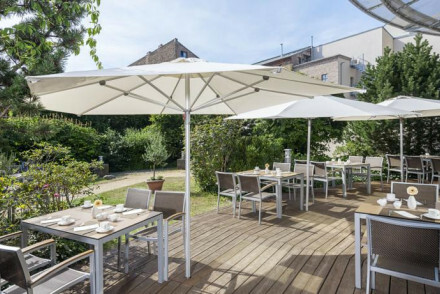 Located in the picturesque Babelsberg district, the hotel features comfortable rooms and bikes for hire that will enable you to explore Potsdam on two wheels. The nearest airports to Potsdam are Berlin Tegel (19 miles) and Berlin Schonefeld (22 miles). The best time to visit Potsdam is from May to September, when the temperature sits comfortably in the twenties. Browse through our list of the best places to stay in Potsdam. 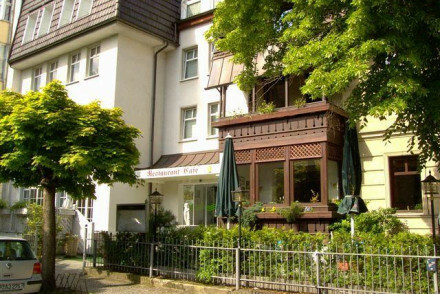 A charming bed and breakfast set within pretty gardens in central Potsdam. Well-proportioned rooms are simple in design, clean and comfortable. Indulgent breakfast for a hearty start to the day. Walking distance to many of the local attractions. An ideal base for exploring the city. Local exploring - Close to Potsdam's sights yet set within a tranquil garden. Great walks - Take a stroll around the Sanssouci park, just minutes from the hotel. Sights nearby - Walking distance (through a lovely park) to the Ruinenberg Castle. A glorious Bavarian chalet set in the Potsdam game reserve. Completely surrounded by nature with wonderful views and access to park activities. Michelin star restaurant serves innovative German cuisine, a fabulous spa for total pampering, and elegant rooms and suites. Good value! In/by a Nature Reserve - Located in the heart of the Potsdam game reserve. Traditional - Built in 1847 in the purest Bavarian tradition. Foodies - Award-winning Michelin star restaurant. A recently renovated historical building in a quiet district of Potsdam. The elegant rooms feature traditional wallpaper, crisp white linens and brass fixtures and fittings. With an indulgent breakfast and easy access of Potsdam's sights and restaurants. A tranquil base for city exploration. Local exploring - Well located in the picturesque district of Babelsberg and close to Potsdam's sights. Sights nearby - The Marble Palace and Glienicke Palace are a must-see. A 19th-century tower set high above Potsdam and boasting epic city views. Individually styled rooms feature traditional chintz fabrics, large sash windows and antique furniture. An atmospheric gentleman's bar is the perfect spot to unwind after a day exploring the city. A charming stay. Local exploring - An ideal city break, just minutes from Sanssouci Palace and close to Potsdam's shopping district. Great walks - Head out for a wander through the city to Luisenplatz Square and Dutch Quarter. Sights nearby - Just a three minute walk from Potsdam's Sanssouci Palace. An elegant 4-star property in the heart of the Old Town. Stunning rooms boast large french windows leading onto pretty balconies all dressed in a traditional style. With a smart bar and excellent regional cuisine in the restaurant. Walking distance to many of the cities main sights. Local exploring - A glorious property situated in the heart of the Old Town and withing walking distance to many of the cities' sights. Sights nearby - Visit the Glienicke Bridge (Bridge of Spies), the Russian settlement Alexandrowka and the Dutch Quarter. Sailing - Take a scenic boat ride on the Havel Lake. A luxury hotel and modern spa in the heart of Potsdam. Elegant rooms are light and airy with large sash windows, soft hues and contemporary art. Find Mediterranean dishes served in the contemporary glass-fronted restaurant. The spa provides the ideal place for city relaxation. Very chic. 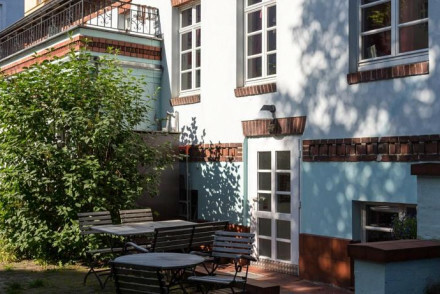 Local exploring - Located in the heart of Potsdam and within walking distance of many of the cities attractions. Sights nearby - Wander around the picturesque Dutch Quarter and visit the Nauener Tor Gate. 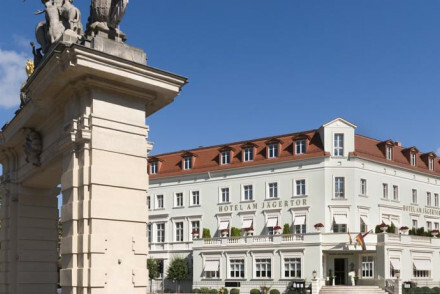 This 4 star hotel in the heart of Potsdam is a stone's throw from all the local sights, perfect for a spot of city exploring! It has a baroque façade and offers spacious rooms with contemporary decor. Be sure not to miss out on the large breakfast buffet served every morning before you head off. Local exploring - Located in the heart of historic Postdam, only a short walk from the main sights, its ideal for a chic-city break. Sights nearby - Be sure to check out the nearby sights such as the Brandenburg gate, Luisenplatz square and Sanssouci Palace. Local markets - The hotel sits just a few minutes from Potsdam's fantastic Christmas market, a must for any winter visitor.